Indonesia executes eight citizens of Australia, Brazil, and Nigeria by firing squad after years of international outcry. Indonesian soldiers stand guard at Wijaya Pura port ahead of the executions of the Bali Nine on April 27, 2015 in Cilacap, Central Java, Indonesia. Eight convicted drug smugglers were executed by firing squad in Indonesia today, including citizens of Australia, Brazil, Nigeria, and one Indonesian. The execution of a ninth convict, a Filipina woman, was postponed while her case is reviewed. A French citizen, also on the list to be executed, had earlier won a two-week reprieve. The case of the “Bali Nine,” who were arrested in 2005 while trying to smuggle 18 pounds of heroin from the island to Australia, sparked international condemnation of the Indonesian government and has strained relations between Jakarta and the convicts’ home countries, but President Joko Widodo rebuffed pleas to grant any of the nine clemency. The sad fact is that politics is probably what sealed the Bali Nine’s fate. Widodo’s popularity has dropped from 71 to 30 percent and he’s largely seen as weak, ineffectual and overshadowed by his party leader. But while Widodo may not be popular in Indonesia, the death penalty certainly is: Indonesia resumed the death penalty in 2013 after a five-year unofficial moratorium, and public opinion overwhelmingly supports the practice, including for non-violent offenses. There’s even growing support for using it against corrupt officials. 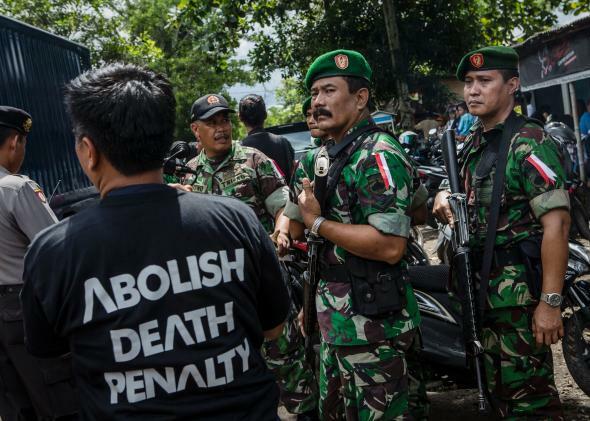 With that kind of public love for the death penalty, Widodo probably didn’t have the political capital to back down on the executions even if he had wanted to. Widodo, who swept into office last fall as a populist reformer, is also a staunch drug warrior and has cited the dubious stat that 40 or 50 Indonesians die every day to justify the executions in interviews and speeches. Indonesia is just one of a host of countries that recently reinstituted the death penalty—including Nigeria—and isn’t the only place to execute people for drug crimes. According to Amnesty International, at least nine other countries did so in 2014. It’s still unusual for countries to execute foreign citizens for crimes other than murder, but given international trends, it seems almost inevitable that this will happen again. The Bali Nine case may serve as an instructive lesson in how not to win a reprieve.